Yes, Holy Week be Upon Us! This is the week that I am more “in” church than “out” of church. I love the solemnity of it, the beauty of it, the pathos of it — and the questions that I ask myself all week long: “How much of this stuff is actually true???! !” Who the heck knows, right? As a minister, I’m supposed to tow the party line & buy it all, but I know it won’t surprise you to know that I question every single solitary thing. But I still love it…. I love it SO MUCH, in fact, that, yes, I am back in school, completing the next phase of my ministry degree. I know I said I was done, but it turned out — I was wrong! I don’t need all this education to be a mionister (that’s Olde French for “minister”), but I still crave that Masters in Divinity, so I am sticking with school, for now. We’ll see how I can manage that once I move back to New York, but for now, I am back in school and loving it. And also on Spring Break! Yay. Just in time to be at church constantly. So. Wow, the re-writes of the original stage musical I am working on with that actress in New York City– it is going spectacularly well!! Yes, after several months of pulling teeth, pulling hair — I don’t know; what else can we pull out in frustration? Whatever it was, we pulled it and we are almost done with the revisions of Act One and I still think the show is incredible, gang. It already won one award — these revisions are being done on a grant from the Canadian Arts Council. The play won the actress/writer the Best New African-Canadian Playwright award — something like that. So the lovely world of Canada is paying my wages and will pay my airfare to NYC soon, to work in person with the actress and the music director, and everyone else. (I know, I keep saying I will be going to NYC soon to work on this, and it keeps getting postponed, but, naturally, now that I am back in school, the trip is imminent again!) But I am a big fan of Canada now. Yay! Honestly, what’s not to love?? On that lofty note, though, I do want to wish everyone a very blessed Holy Week. Even if you aren’t a big Christ-follower yourself, there is a whole lot about human nature that we can learn from this week. Mainly, that when Christ entered Jerusalem on Sunday, he was already a dead man walking; the same crowds that cheered him on Sunday, had him nailed to a cross by Friday morning… Funny, how the more things change in 2000 years, the more they stay exactly the same, right? Something to ponder, anyway — how the “crowd” will turn on you on a dime. I hope you are gearing up for a fantastic spring. Things simply could not be better over here — I hope it’s likewise wherever you are! Thanks for visiting, gang. See ya! 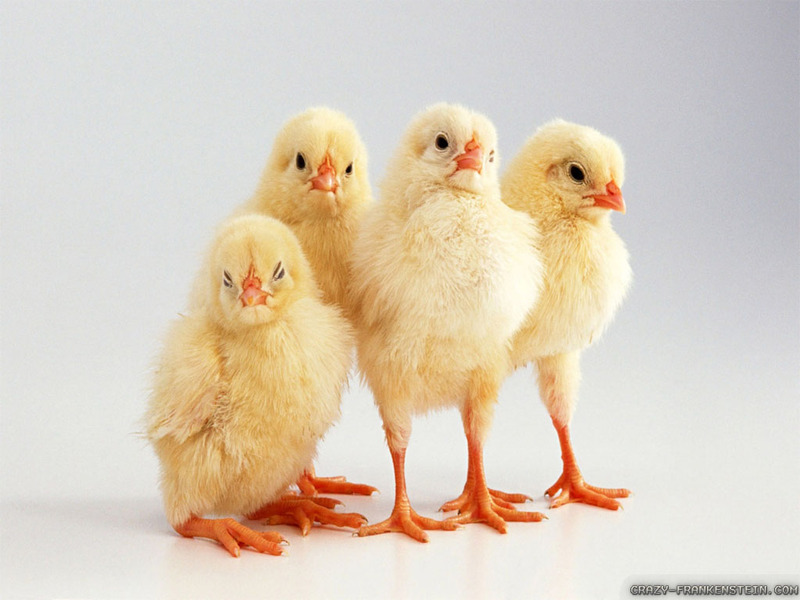 Spring chickens — hey, they look a lot like YOU! !